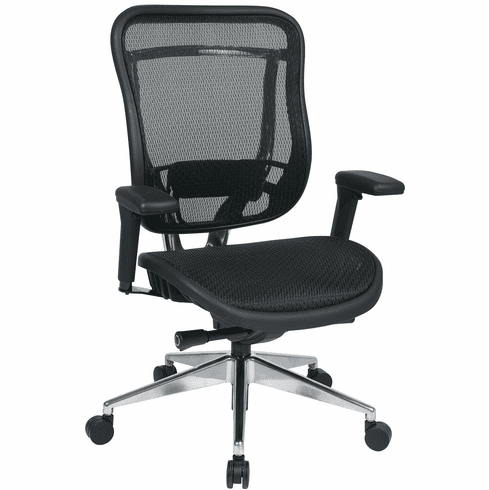 SPACE Big and Tall Executive High Back Chair with Soft Padded Arms, Breathable Mesh Back and Breathable Mesh Seat. Breathable Mesh Seat and Breathable Mesh Back with Adjustable Lumbar Support. One Touch Pneumatic Seat Height Adjustment. Deluxe 2-to-1 synchro Tilt Control with 3-Position Lock, Anti-Kickback, Seat Slider and Tilt Control. Height Adjustable Arms with PU Pads. Rated for 300 Lbs. Polished Aluminum Base with Oversized Dual Wheel Carpet Casters.